On 20 August 2016, children play near a broken water main, which was damaged by fighting in the Sheikh Saeed neighbourhood in eastern Aleppo, Syria. Addressing the media in Geneva, a United Nations spokesperson today highlighted the challenging working environment in which UN humanitarian agencies are operating in within Syria and flagged that aid is being delivered to all those who need, regardless of their affiliation and where they live. “From the planning process to the actual response, we are guided by our determination to assist people affected by this terrible crisis in accordance with core humanitarian principles of humanity, neutrality, impartiality and independence,” United Nations Office for the Coordination of Humanitarian Affairs (OCHA) Deputy Spokesperson Jens Laerke told a news briefing in the UN Office in Geneva today, in response to claims made in UK newspaper The Guardian. The conflict in Syria has left some 13.5 million people in need of urgent humanitarian assistance, according to OCHA. However, with each passing year, as the conflict in Syria has worsened, the scale of the humanitarian crisis has escalated. UN humanitarian agencies have responded by scaling up programmes and reach, delivering from within Syria, across borders and by airdrops in all parts of the country. Their assistance includes safe water, food, nutritional supplements, medicines and health support, as well as programmes supporting education, protection, vulnerable people, support to women-headed households and more. UN humanitarian agencies and partners are currently operating within a very large humanitarian response plan which calls for $3.2 billion in funding, and of which just 33 per cent has been received so far. The spokesperson addressed the UN’s work with all parties to the conflict, including relevant departments of the Government of Syria, to reach people with the life-saving support they need. In his remarks, Mr. Laerke said that the UN delivers to all areas of the country – irrespective of the status of control and using the most effective methods, including deliveries to non-government controlled areas through UN Security Council-authorised cross-border deliveries from Turkey and Jordan and deliveries from government-controlled areas across conflict lines to besieged and hard-to-reach enclaves. 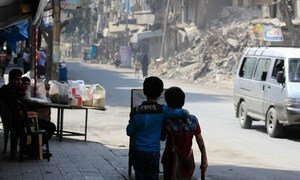 Regretting the intensified fighting and grave humanitarian situation in Syria, the United Nations Special Envoy for the country, Staffan de Mistura, reiterates the need for a political solution to the conflict there, according to his spokesperson Jessy Chahine.